Has it been like 2 years? I had honestly forgotten everything :/ After a year my mind starts to let things go. I could not even remember why they could not have smex! But the thing is, it did not matter that I did not remember things. The book worked great anyway. Of course I did wonder why they could not do the deed, which lead to more thoughts, lol. It is a novella, so it is a fast read. It is book 5 and in this one Lonen, our handsome barbarian king, is with Oria, his beautiful witchy wife. His asshat of a brother has thrown down the gauntlet and they need to take their kingdom back. Ugh Nolan, I do not remember you, and I still do not like you, asshat you. There is also a magic mirror that causes problems. 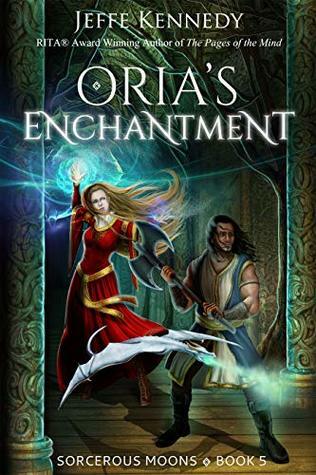 Oria's magic is different. I like that it was a fast read and that I did not have to remember everything clearly. I could just go with the flow. I like a quick good read. One more to go! I hope you like how the series ends! My memory works about as well as yours. If it gets longer than a year between series reads, I forget a lot about the previous books. What a strange book where not much happens, but still a lot happens, lol. At least you can pick up again after 2 years! I don't know - sounds too much like another part of Conan the Barbarian. Or something. I felt the same. Nothing happens, but a lot happens. That seems to be a theme in fantasy, but that's okay. I do enjoy them. Great review.